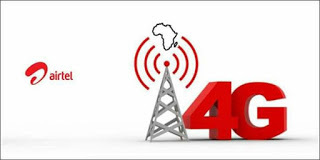 Airtel Nigeria 4G LTE service was recently rolled out in three states in the country: Lagos, Ogun and Oyo; with plans to spread it over to other key cities this year in a bid to improve its administrations. Another good news is that once you switch to Airtel 4G, you'll be given free 4GB data which can only be used on the 4G network. The Telecom giant will also credit you with 25% data bonus when you activate data plans from N500 and above for the next 3 months. According to Segun Ogunsanya, Chief Executive Officer and Managing Director of Airtel Nigeria: "This is a new dawn for mobile internet in Nigeria. Airtel and ZTE’s collaboration to roll out 4G service plan in Nigeria will dramatically improve mobile internet experience for telecommunications consumers across the country. Indeed, Airtel is committed to strengthening its position as a true pioneer of innovation in the Nigerian telecommunications domain. This is in line with our overall corporate vision of becoming the mobile Internet service provider of first choice for every Nigerian." Airtel's 4G LTE which runs on Band 3 – 1800MHz with a Download speed of of 28.45 Mbps and 8.77 Mbps Upload speed is achieved as a partnership between Airtel and Chinese multinational giant—ZTE. You can swap your current Airtel SIM or buy a new 4G SIM card to enjoy Airtel 4G services and the free 4GB and 25% data bonus. Simply walk into any Airtel retail outlet today and request a 4G SIM upgrade from the Customer Care agent, then you'll be given a form to fill and your SIM card will be upgraded. Meanwhile, make sure you backup your contacts before doing so.